Cooking pasta is a staple skill you need to know in the kitchen and anyone can learn. It just takes a bit of practice and knowledge. There are a few kitchen items that you will need to get started like a stock pot, long-handled spoon, and a kitchen timer. In terms of ingredients, you need only three things: water, pasta, and salt. Fill a large stockpot with water. The more water the better. Pasta tends to stick when it is cooked in too little water. Add salt to the water. Salt makes pasta taste better, and will not appreciably increase the sodium level of your recipes. Use 1 teaspoon per gallon of water. At that level, 2 ounces of uncooked pasta (1 cup cooked), the FDA serving size, absorbs about 20 mg of sodium which is about 1 percent of the recommended daily sodium intake. That is minuscule. Bring the water to a rolling boil. This means it is a boil that you cannot stop by stirring. Measure the pasta you need. Pasta generally doubles in size when cooked, so 1 cup uncooked yields about 2 cups cooked. Slowly add the pasta to the boiling water. Ideally, the water should not stop boiling, but if that happens, it is OK. Start timing when the water returns to a boil. Most kinds of pasta cook in 8 to 12 minutes. Check the package directions. Stir frequently. Pasta will stick together if it is not stirred during the crucial first moments of cooking. Do not add oil, because that will make the pasta slick and the sauce will not stick to it when it is done. You can regulate the heat so the pasta and water mixture does not foam up and over the pot sides. Lower it a small bit, and everything should be under control. Or you can add a little butter to the pot; this reduces the surface tension of the water so it will not boil over. The only way to tell if the pasta is correctly cooked is to taste it. It should be al dente, which means firm, yet tender, with a tiny core in the middle. You cannot fix overcooked pasta. Test it 2 minutes before the earliest cooking time stated on the box. You can also cut into a piece of pasta you have fished out of the pot. There should not be any solid white in the center of the pasta just a more opaque cream color. 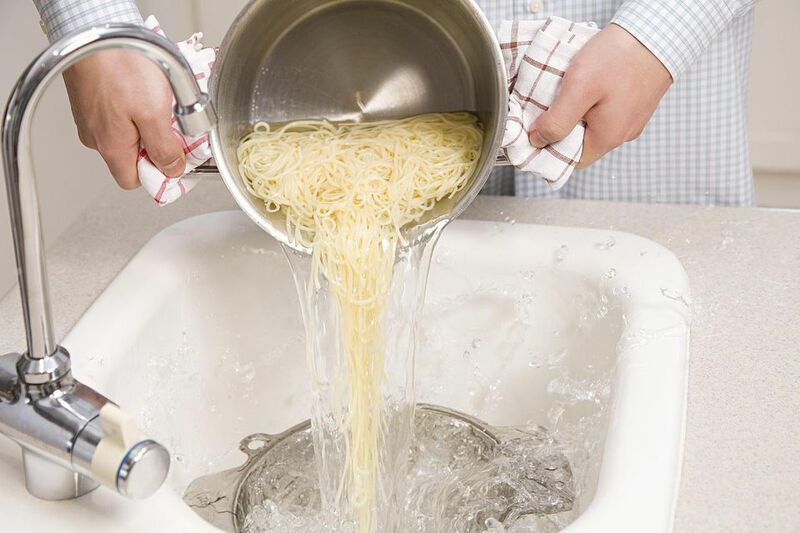 When it is done, drain the pasta into a colander placed into your kitchen sink. Lift the colander and shake off the excess water. Do not rinse the pasta if you are serving a hot dish. That removes the starch that helps hold the sauce. If you are making a cold salad, then rinse so the salad is not sticky. The exception is if you are making a cold pasta dish that has a dressing that you want the pasta to absorb, then do not rinse the pasta in that case. Use the pasta in a recipe, toss it into simmering sauce, mix it with a cold sauce, add to salads, or use it in frittatas. If any pasta is leftover, store it. Cover the pot: By covering the pot when you bring water to a boil, you are lowering the air pressure directly over the water, making it easier to boil. Do not mix pasta types in one pot: Different shapes of pasta all have different cooking times; read package directions carefully. Watch the clock: If you do not use a timer, then watch the clock closely. Pasta can overcook very quickly and get gummy and gluey. Add to a casserole: If the pasta is to be used in a casserole, undercook it slightly. It will finish cooking to perfection while in the oven or skillet.